Many years ago, my literary agent at the time invited me to a party in Cambridge at the home of "Alice Hoffman," whose work he also handled. I put her name in quotes because she was already a phenom and I was still a long year away from seeing a book with my name on it in print. Memories of that party have stayed with me over the years, including a conversation I had with Alice that night. In retrospect, it was really nothing extraordinary but as a young writer in the company of another young writer who'd already made a mark, what she said left an indelible memory such that I can even quote it today. But I never read her work. Then serendipitously, a friend who occasionally sends a note to someone saying "meet my friend, Jessica" sent such a note to Alice last week. In the volley of emails that preceded it, I'd mentioned that I was reading People of the Book, Geraldine Brooks's new novel about the Sarajevo haggadah, the order of service for Passover, that survived for centuries even as the Jews it belonged to did not. Alice replied a short while later, saying that if I were interested in the Inquisition, I might want to read her book, Incantation. If every life is a river, then it's little wonder that we do not even notice the changes that occur until we are far out in the darkest sea. One day you look around and nothing is familiar, not even your own face. My name once meant daughter, granddaughter, friend, sister, beloved. Now those words mean only what their letters spell out: Star in the night sky. Truth in the darkness. I have crossed over to a place where I never thought I'd be. I am someone I would have never imagined. A secret. A dream. I am this, body and soul. Burn me. Drown me. Tell me lies. I will still be who I am. Thank you, Alice. Now on to more of your work. And seriously, friends. Read it. First comes the news this week, via Publishers Marketplace, the daily roundup of new book deals, that Roland Merullo, the great Endless Knots favorite, has sold three, yes, that's t-h-r-e-e, new books. Next up, Jesus and the Journalist to Algonquin, which has published his previous two books in this series (Golfing with God and Breakfast with Buddha--you can read my brief write-up here and about which more below**--wherein The Son returns to Planet Earth and Contemporary America. Hold onto your stomach--and your hearts. The previous books, allowing us to cozy up to God and Buddha, are hilarious and touching and the cause of great self-reflection. Read any of them and you'll see what I mean. Besides the Jesus book, he's sold "two untitled novels to Shaye Arehart at Shaye Areheart Books." Wait. I forgot: he's got yet another book coming sooner from Touchstone Fireside, Golfing and Eating in Italy, based on the trip he and his family took to Lake Como last summer, and about which he wrote a few op-eds while there for The Boston Globe. Merullo writes with grace and intelligence and knows that even in a novel of ideas it's not the religion that matters, it's the relationship; it's not the concepts, but the people, and here are two intriguing men, one with his eye on the destination and his foot on the pedal, the other who knows that we travel farthest when we are still. You'll enjoy sitting in the back seat of the car as Otto drives on deep into the luminous heart of his childhood. It's a quiet, meditative, and ultimately joyous trip we're on. And it's quite a treat, indeed, to eavesdrop on these two inquisitive and witty gentlemen and hear what they talk about when they talk about life. The signature sound of Rosh Hashanah is the blare of air through a ram’s horn, the shofar in Hebrew. Insufficiently educated in Judaism, I would have to consult Jewishpedia (it exists?) to explain its significance. What I do know is that it is the emblem of this holiday. He began by having me say two prayers, the first six words of which are inscribed in my brain because, so far as I know, every Jewish prayer begins with the same six words: Baruch atah adonai elohenu melech ha-olam and then I had to fudge it, pretending I knew where he was going. I hchuhched sufficiently to cover my ignorance. My daughter got to say Amen. Twice. At which point the young man sucked in a goodly amount of air and expelled it slowly and rhythmically through the pearly horn. Dressed in a black suit, white shirt, black hat with a broad rim, black shoes, and what looked like it might be a trendy tan t-shirt underneath, he blew through the shofar for a good long minute, and, when he was done, we thanked him and he us. We wished each other a Happy New Year and that our names would be inscribed in the Book of Life. May yours too. And for those with a sense of humor, see Rosh Hashanah Girl. Twenty four years ago today, Bucky Fuller died, 36 hours before his wife, Anne, passed away. Bucky had a heart attack while Anne was in a coma and neither ever had to suffer knowing of the other's death. I took this photo of the marker on their graves at Mt. Auburn Cemetery in Cambridge, Massachusetts, on May 23 of this year, the birthday of Bucky's great-aunt, Margaret Fuller, about whom I will write much here in the time to come. Geodesic-dome man, dozens of books, marathon speaking jags, perpetual travel, nearly blind, a penguin's gait, inventor of a thousand things conceptual and manual. "Grandfather of the Future" in John Denver's "What One Man Can Do." Bucky had dinner at our house on February 10, 1977. On his lap in this picture is The Boston Globe folded to a feature story, "Bucky Fuller Has His Day." I wrote it. Buckminster Fuller Institute has a great online archive of his work. And we remain greatly honored that Bucky wrote the Foreword to our second book, The Networking Book. Click the link, then choose Foreword and you're all set to read his prophetic words. "Dear Mom and Dad," the postcard reads. "I have arrived safely in Meridian Mississippi. This is a wonderful town and the weather is fine. I wish you were here. The people in this city are wonderful and our reception was very good. All my love, Andy." Dated June 21, 1964, Meridian, Miss, 4-cent postage. That night, Andy, Michael Schwerner, and James Chaney, all civil rights workers, were murdered in Philadelphia, Miss. Click on postcard to enlarge it. 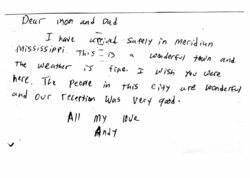 David Goodman, Andy's younger brother and my classmate at Antioch College, recently gave me a copy of Andy's postcard, written the day he died. I keep it on my desk to honor him and to remind me of their mother, Dr. Carolyn Goodman, a buoyant spirit and hard working psychologist, at 92, still beautiful and kind.